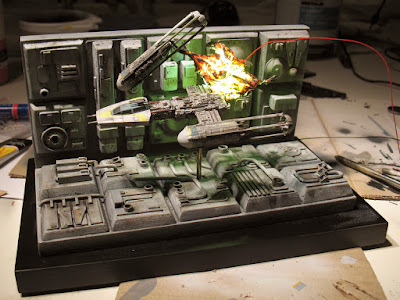 In my latest youtube series I'm building a Star Wars Deathstar Trench diorama with a Y-wing exploding, just as we saw in the first Star Wars movie (A New Hope). For me what was interesting about this was all the elements coming together, the model, the diorama, the lighting and painting. Because these Bandai models are so small it's less time consuming to do all of this. I don't know how much time I spent on this sofar, but I don't expect it to exceed 100 hours. The diorama was pretty straightforward, built using pieces of wood and parts from a tank kit. The Y-wing model because it is so incredibly detailed was easy to build. However, the explosion part was a real headache, I tried all kinds of materials, foam, caulk, styrofoam, cotton. I finally got the best results soaking cotton in wallpaper glue and sculpting a cloud like shape.